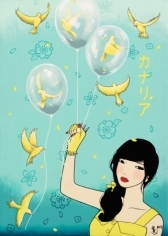 FOLEY gallery is pleased to present a solo exhibition of painter Yumiko Kayukawa. 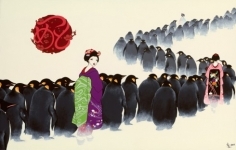 Year of the Fire Horse (Hinoe Uma) continues Kayukawa’s exploration of pop culture, western fashion and the animal kingdom - all fused together with references to traditional Japanese customs and iconography. 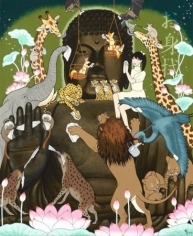 Employing a traditional Ukiyo-e pallet with a contemporary Manga style of painting, Kayukawa delicately balances personal narrative with fantastical natural scenes. The foreboding nature of her paintings are often masked by a playfulness and bold color strikes allowing deeper meaning through symbolism, thus revealing her underlying commentary on the environment, politics and contemporary culture. 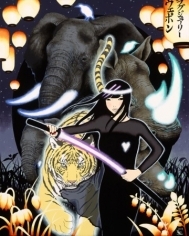 In “Luxury Weapon,” a young “Lara Croft” like figure displays a glowing Samurai blade defending a circle of elephants and rhinoceroses, their tusks and horns glowing, alluding to the luxury bounty that attracts the vision of poachers. 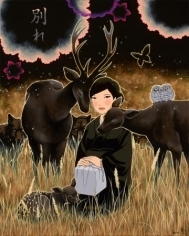 In Separation, a woman dressed in a black kimono sits in a darkened field surrounded by nurturing deer. She gently holds a wrapped box in her lap. The presence of the box and black kimono are seen as symbols of death; the black kimono is worn during the ceremony of the deceased and the box holds the ashes of cremation. The eyes of angry wolves encroach, foreshadowing her impending violent demise. These paintings engage with an inviting, playful and whimsical façade. 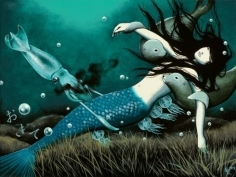 Beneath, a message is delivered, wrapped in fluid poses, enchanting figures and intricate patterns. 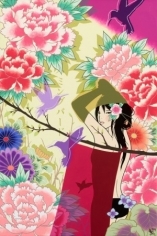 Her use of floating motifs and Kanji (Japanese characters) throughout her paintings provides a rhythm to the narrative. Year of the Fire Horse will remain on view through July 12th. Foley Gallery is open Wednesday – Sunday, 12 – 6pm. To request images; please contact the gallery at 212.244.9081 or info@foleygallery.com.